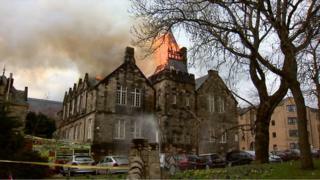 Up to 60 children have been led to safety after a fire broke out in a first-floor classroom at an independent school in the west end of Glasgow. Following the evacuation, pupils were taken to a local community centre. No-one is thought to have been injured. At the height of the blaze, 55 firefighters and 10 appliances were deployed to prevent the fire spreading. Incident Commander, ACO Lewis Ramsay said: "The initial crews have worked tirelessly to tackle the blaze and operations are ongoing to contain the fire. "Members of the local community can be assured that fire crews will continue to work relentlessly until this incident is brought to a safe conclusion. "An effective multi-agency approach with police and the local authority is ongoing to manage the incident and reassure local residents." Police have closed Yorkhill Street, between Old Dumbarton Road and Kelvinhaugh Street, while fire crews continue their operation. The cause of the blaze is not yet known and will be subject to a joint investigation by Strathclyde Fire and Rescue and Strathclyde Police.